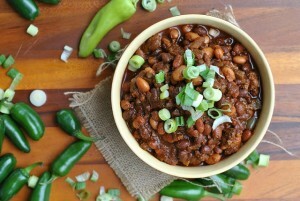 This recipe holds a special fondness in my heart. It is worthy of a Recipe Repeat. 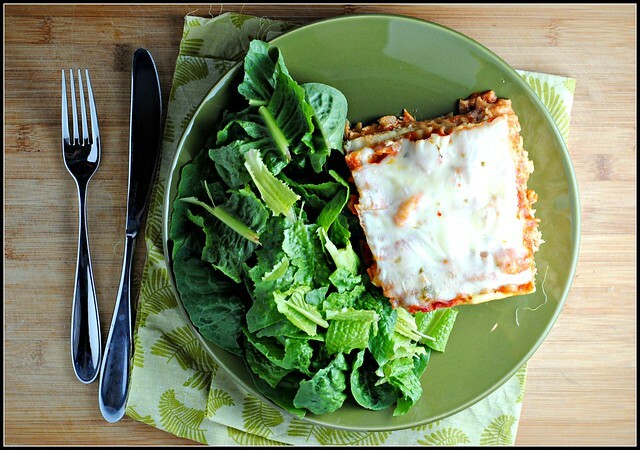 Having known since date #2 (just a guess…it may have been date #1) that Mr. Prevention is obsessed with all things buffalo wing saucy, this lasagna was one of the first recipes I made for him as a newlywed couple. We had just moved into our first home in Tulsa, and I was bound and determined to move beyond my jarred marinara + veggies over whole wheat pasta for dinner…every other night. When I offered up cottage cheese and fruit for dinner, that didn’t go over so well either. And over my dead body would my husband be pulling a Jacks pizza out of the freezer every night and calling it dinner. So began my culinary adventure which is now very well documented by way of this blog. While I was thrilled to have found a winning recipe that husband raved about, I also didn’t want it constantly on the menu. 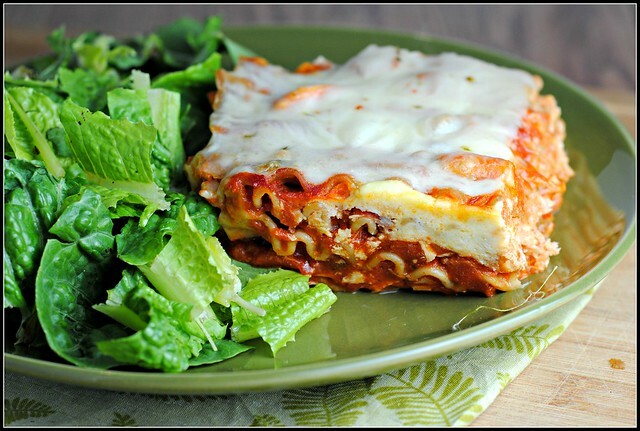 To this day, it never fails that Mr. Prevention requests Buffalo Chicken Lasagna any time I ask, “Hey, is there anything you’d like to have for dinner next week?” when planning our weekly menu. So, I stopped asking…because I knew the answer and I wasn’t willing to fulfill the request. For several reasons. Firstly, the blog must go on. I need new material. Second, buffalo wing anything probably isn’t topping any charts with regards to healthfulness. Besides, variety is the spice of life and that is most certainly the name of my game in the kitchen. 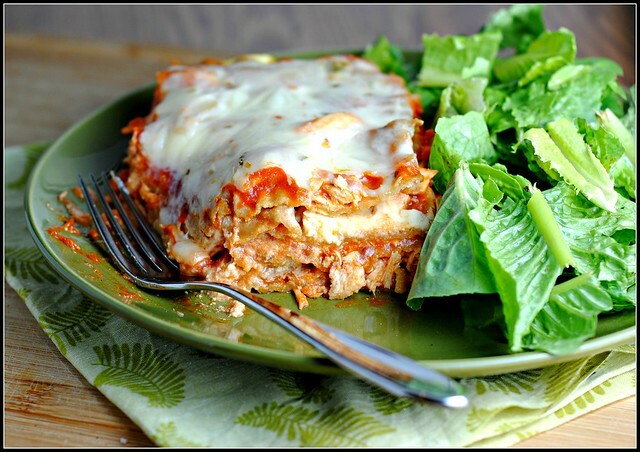 Because Mr. Prevention can’t recall the last time we had Buffalo Chicken Lasagna, he looked it up on the blog and found this post from October of 2009 (such a pretty picture…ahh!). Therefore, he swears that was the last time I made his beloved lasagna for him which is absolutely untrue. 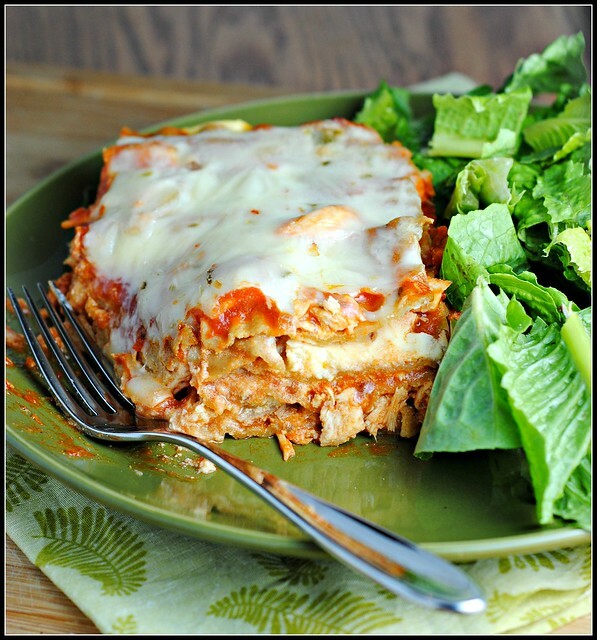 However, the photo needed a major upgrade…and I changed a few things with this Buffalo Chicken Lasagna go-round. I used rotisserie chicken in this updated version of the recipe, but you can certainly saute the chicken and start from there. Leftover chicken would work great, too. I opted for low-sodium marinara to reduce the sodium content (believe it or not). I also decreased the amount of water and let the lasagna sit overnight. It worked beautifully and rather than the cheese and noodles landsliding across my plate, it held together in one perfectly photogenic piece of deliciousness (just be sure you left it sit before cutting into!). Combine chicken, marinara, wing sauce, and water. In a small bowl, combine ricotta cheese and eggs. Spray a 9 x 13-inch pan with nonstick cooking spray. Spread enough sauce to coat the bottom of the pan. Arrange 4 noodles over the sauce. Spread more sauce, then a layer of ricotta mixture. Add another layer of sauce, and repeat the whole process until you end with a layer of sauce. Cover with tin foil and refrigerate overnight (up to 24 hours), or bake (covered) 1 hour. Uncover and place cheese slices on top; bake an additional 8-10 minutes uncovered. Let stand 10-15 minutes before serving. Result: This is a dish that Mr. Prevention requests ALL the time. I caved because I thought the photo needed an upgrade from this one. I adapted it quite a bit from the last time I made it by using an additional layer of noodles and refrigerating over night before baking. I think that allowing the lasagna to sit helped it to hold together and decrease the cooking time. 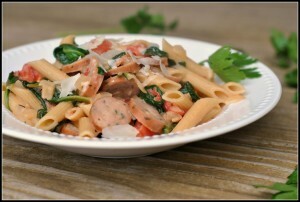 Plus, this can then be prepped ahead of time for a weeknight meal! It amazes me how respectable the nutrition facts are on this dis…with the exception of the sodium. Wing sauce is packed with sodium and that’s a tough one to get around if you want that wing flavor. Enjoy! This week is going to be absolutely positively insane. Glad the Thanksgiving holiday and long weekend was a relaxing one! This looks so yummy and I plan to try it as soon as my kitchen renovation is complete! I saw this on FB and had to check it out. Under 350 calories?! Wowza. Sounds awesome!! I haven’t had lasagna in way too long. I know it wasn’t too long ago you made this – I book marked it the last time it was on your weekly menu, still need to make it!! I’m also obsessed with all things buffalo saucy! Okay, maybe I am blind, but am I missing the temperature at which this is supposed to be cooked? : ) Haha. I assumed 350, but just wanted to check! Excited try this tonight! Not blind….sorry about that! It is 350 – enjoy! I was wondering if I could add some ranch dressing to this? My family loves wings with rance. Hi Sandra! I would drizzle it on top – yum! Thanks so much. I am excited to make this. When do you add the pepper jack? If you let it sit overnight, how long do you actually cook it for? Hi Bre! I would say 50 minutes — not too much different. So you don’t cook the noodles before you start layering? Congrats on the shout out from the Fox News Magazine! This is a really nice recipe. But also try Caribbean Jerk Salmon with Mango Salsa So delicious! You need to try this recipe!